and 210337 calories that aren't clinging to my waistline. A year of challenges, victories, discoveries, and defeats. 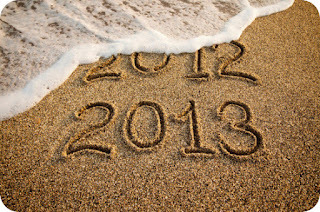 Looking forward to more, in 2013. Beautiful day in Long Beach. 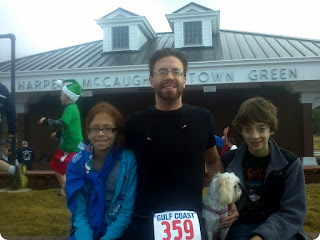 Everyone gathering on the town green for a little 5K event: Jingle Bell Run - 2012. Took the kids. And Molly Dog. Kids bickering over who holds the leash. Everyone loves that little lion of ours. When the race began, she wanted to run, too! Temperature started off in the 50s. Wore pants. Almost wore sleeves. Ended nearly 70. Sweated most of the way. Regretted those pants most of all. Smooth roads. Water mid-way. No idea how many runners. Maybe 300. Many kids. Some seniors. Few dogs. Very friendly run with lots of happiness in the air. No intervals. No stopping. Passed the folks I wanted to pass. Got passed more than I wanted to get passed. Didn't do badly, but I didn't do well. 27:33. Unofficially 83rd place. (Not everyone went the full distance.) If I actually slept last night, if I hadn't spent time yelling at the toilet, and if I were hydrated, I might have done better. But I'm happy with the performance, given my silly conditions. Great way to start the day, and I enjoyed the time with the kids. Maybe one day I'll have them running next to me. Shortly after, I'm sure I'll have to catch up with them. But I enjoy what I have. It's all good. Including the Jingle Bell Run!